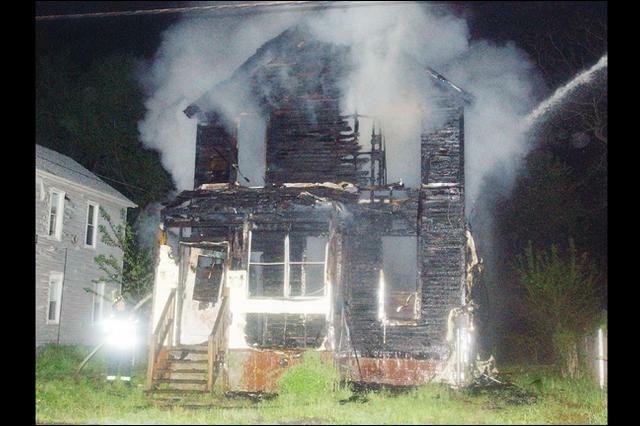 ASHTABULA � Smoke could be seen more than a mile away early Sunday morning as fire consumed an unoccupied structure at 907 W. 38th St. The house was fully involved in flames as fire trucks arrived at the scene, Ashtabula Fire Capt. Mark Calaway said. As firefighters fought the growing blaze, siding melted off the side of an adjacent building. The 2009 Dickman Directory lists Bill and Peggy Farley as the owners of the house. The Farleys live in Pioneer, Ohio, the Ashtabula County Auditor�s web site reveals. The eight-room home has a taxed market value of $24,300, the website states. Calaway said firefighters searched the house for victims and found no one in the structure. No firefighters were injured while fighting the blaze. The Ashtabula Fire Department was assisted by the Ashtabula Township Fire Department in fighting the fire, Calaway said. A neighbor living near the home said he heard popping noises and came to his front door to find the house across the street on fire with flames shooting out the windows. The firefighters arrived on the scene at 12:02 a.m. and packed up their hoses at 2:49 p.m., Calaway said.